An original fairytale written by Michael and Katrina Zlatkovsky for their wedding, inspired by the original Swan Lake story and incorporating Tchaikovsky's music for the ballet. Michael's narration of the story -- complete with Tchaikovsky's music in the background -- can be downloaded here. Once upon a tale, when the earth was still young, there grew a beautiful flower. It had seventeen delicate petals, each endowed with a magical spark. It was said that anyone who gazed upon this flower, and smelled its fragrant scent, returned home blessed with unusual luck in finding happiness for the rest of their lives. Grand fables and tales spread throughout the land, speaking of a magical flower with extraordinary powers. But the petals themselves, seized and fought-over by greedy men, were torn from the flower’s stem and spread throughout all the corners of the world, their power diminished. It was said that only the one who could unite the petals could bring peace and prosperity upon himself and his people – but no possessor of the magical petals was willing to give up his own prized treasure. Over time, all that remained of the flower was a legend -- a children's story -- and few but the wise and the naive believed in the flower's existence, let alone in its alleged might. It was in this age that there lived a prince, who, from childhood, had heard of the flower lore. Even as he grew into adulthood, he continued to believe in the old magic, and in its ability to bring him happiness and to someday make him a great ruler of his father's kingdom. And so one morning, he straddled his silvered horse and rode into a long and perilous journey, determined to return home with the mystical petals. The prince crossed narrow bridges over deep and foreboding precipices, journeyed over rivers of fire, clashed his sword against the unbreakable scales of ferocious dragons, and bargained with rulers in neighboring kingdoms by performing heroic deeds -- all for a handful of delicate and unwithering petals, which the prince kept carefully tucked in a traveling pouch. At last, he had found all but one petal, which was said to have been blown off of the flower by a powerful gust of wind, right before all the rest of the petals were taken captive and scattered. It was now in search of this last petal that the prince rode forth, hoping that the wind that once took the petal would chance to return it to him. Meanwhile, in a distant land, there lived a fair young maiden, who often ventured into the woods to pick berries and wild mushrooms and flowers. One day, an unusual petal flew into her basket -- a petal that looked ancient and unlike anything that grew in the surrounding forests, yet was as fragrant and fresh as if it was still attached to a growing flower. As she paused to admire it, wondering what strange chance had brought the mysterious petal to her, an owl, soaring high above the trees, was attracted by the petal's unnatural shimmer. Like a rock the owl dropped to the ground in front of the girl, transforming into an old and wicked sorcerer. "You know not what you hold!" the sorcerer bellowed, "Give back the petal, for it contains magic that I alone am entitled to possess!" Terrified, the girl flung the basket of mushrooms at the sorcerer, and ran deeper and deeper into the woods. Behind her, she could hear the screeching and the beating wings of the sorcerer-owl. Soon, to her terror, she saw that the path she had taken was leading straight into the shore of a lake. In desperation, as she rounded a corner, she tucked the petal beneath a clump of green moss, where the owl would not be able to find it. As the path emerged at the lake's shore, the owl flew straight at girl and turned back into the cackling sorcerer. Yet when he discovered that she had fooled him, and had hid the petal somewhere along the way, the sorcerer became enraged. Raising his staff, he turned the maiden into a swan, so she could never tell of the secret she knew to anyone else. The sorcerer-owl then flew away, determined to keep a watch on the swan lest she should try to retrieve the petal. Around this time, having traveled far and wide and finding no trace of the last elusive petal, the prince had come to the land where the fair maiden had lived. He was traveling slowly through the forest, his spirits sunken, when suddenly, just off of the path that he was following, he saw the shimmer of moonlight on the surface of a lake, and gliding gracefully through it, a snow-white swan. He watched her, enchanted, until the moon disappeared completely beneath the clouds, and the prince found himself engulfed in darkness. In the morning, the prince once again watched the beautiful swan glide through the calm waters. As he proceeded to return to the lake every morning and evening to watch the majestic swan, she grew accustomed to his presence, and would flap her wings happily and glide close to the shore when he approached. On his part, the prince was glad of the company, and would tell the swan of his beloved homeland and of his plentiful adventures. One day, as the prince was telling the swan about his quest for the very last petal, the swan became very alert and excited. When he finished, she flapped her great wings to get out of the water, and started waddling down a forest path. Perplexed, the prince followed her, and soon they came to the mossy nook where the girl, pursued by the sorcerer, had once hidden the magical petal. The swan dug her long black beak into the moss, and, turning to the prince, dropped the petal towards his outstretched hand. Suddenly, like lightning, the sorcerer-owl swooped towards the prince, grabbing the falling petal with his beak, and, with his talons, seizing the prince's pouch that contained the remaining petals. Then, flapping his wings triumphantly, the owl flew out of the range of the prince's sword, and turned the prince, too, into a swan. "Now the secret is mine and mine alone!" cackled the sorcerer. "How fitting, noble prince, that the petals you sought to make you a great ruler will now give me the power to conquer and destroy your land!" The evil sorcerer flew back to his mountain dwelling, where he began to concoct a most malignant array of powders and mixtures and spells, toiling for many a week in preparation for harnessing the flower's great powers. 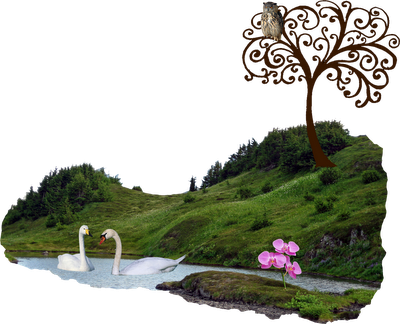 Meanwhile, passing travelers through the forest would often stop to admire the two beautiful and inseparable swans, who, unlike other swans at the time, seemed to have chosen each other for life. Before long, the sorcerer was ready for battle, and prepared a large cauldron of sanguine potion to render himself more powerful than ever before. Yet, as he tossed the petals into the cauldron, the powers of good within the flower refused to be subjugated to such an evil purpose. The cauldron erupted into flames, and when the smoke cleared, all that remained were seventeen petals, floating away in the wind and looking as fresh and fragrant as ever, and a benign little owl that had lost the magical powers and the mean demeanor of the evil sorcerer. With the demise of the sorcerer came also the end to his evil magic, and the two swans turned back into a fair maiden and a noble prince. They were happy to have re-gained their human form, and, more importantly, to have found each other -- as happy, indeed, as any whom, in the days of old, had beheld the magical flower. As they approached the prince’s kingdom, trumpets were sounded, and friends and families of the couple, clad in beautiful attire, gathered about the prince and his bride. And so it was that, once upon a tale, a truly fairy-tale wedding took place. (click above for a larger image).